Safety comes first in scuba diving and to be safe, it is important that you plan your dives with your buddy in advance. Your dive table, and to an increasing extent your dive computer, are your most important tools in dive planning, especially when you want to make multiple dives throughout the day. The PADI Recreational Dive Planner (RDP) is most widely available in two formats, the table format and The Wheel. You might also use the SSI dive table depending on whether you are trained in PADI diving practices or in SSI practices. Despite being based on the same model, computers tend to give divers a little more dive time than the manual RDPs as they eliminate the need for unnecessary rounding and calculate decompression limits based on actual dive times. Therefore computers are quickly gaining popularity. In your very first scuba dive course, you most likely learn how to use either one of the tables to plan multiple dives. It is crucial for diving safety that you practice your skills regularly and update your knowledge by reviewing your course books and dive planner before you go diving, especially if you’ve been inactive for a while. There are several online sources to help you refresh your memory on how to use dive tables, however it’s always a good idea to review these skills with a certified divemaster or dive instructor. Above are examples of the commonly used PADI Recreational Dive Planner and the SSI Doppler Dive Table. You may have learned to use other tables or charts to plan your dives as there are many different types. Dive tables are generally based on modern decompression theory. As a precaution, you should always keep in mind that it is a theory these tables are based on, and it is a good idea to stay well within the decompression limits of each table. Below is a very basic instruction on how to work out your pressure group after mutliple dives using the PADI dive table. You can use these instructions to log your dives in your log book. Step 1: Note down the dive time (Total Bottom Time) and maximum depth of your first dive. Step 2: On the front left of your dive table, where it says ‘Start’, find our maximum depth (rounding up if necessary). Then move down the column to find your Total Bottom Time (TBT). If you move across the row to the left, you will hit a letter. This is your pressure group right after surfacing from your first dive. Step 3: Note down your surface interval. Step 4: To work out your new pressure group after the surface interval, find your inital pressure group after surfacing on the front of the table again. Then move across the row to the right until you get to the second table. Keep moving across until you hit the box with your surface time, then move down the column. The letter you find here is your new pressure group upon re-entering the water. Step 5: Flip the table over. 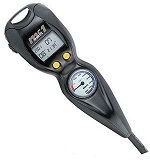 You should now have the dive time and depth of your second dive handy. Step 6: Find your pressure group after the surface interval in the top row of the table. Along the left side of the table, find the depth of your second dive (again rounding up if necessary) and follow the row to the right until it meets with your pressure group. In that box you will find two numbers: One on white (Residual Nitrogen Time), and one on blue (Actual Bottom Time). Step 7: To find out your new pressure group after your second dive, you need your Residual Nitrogen Time, which is the number on the white portion. Remember it or note it down. Step 8: Take the Actual Bottom Time (ABT) of your second dive and multiply it with your Residua Nitrogen Time (RNT) from the white portion of the back side of the table. The result is your Total Bottom Time (TBT). Step 9: Flip the table back to the front. Step 10: All that’s left now is to use the new Total Bottom Time and the depth of the second dive to work out your new pressure group just like you did for your first dive. Again, where it says ‘Start’, find the depth of your second dive. Then move the column down until you hit the box with the Total Bottom Time that you worked out by multiplying the two numbers earlier. The letter on the left is now your new pressure group. If you did more than two dives, you can now repeat the procedure with the new numbers. 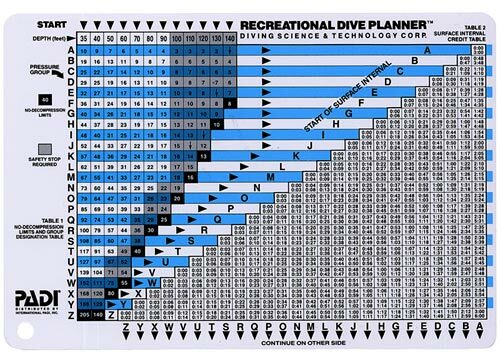 The Recreational Dive Planner can also be used to find out how long you can stay under water at a certain depth, or how deep you can go on a repetitive dive if you want to stay under water for a certain amount of time. If you need to review your skills in using the dive table, please talk to your local dive centre. We're probably out on the water but you can always leave us a message. We'll be right back! ©[current-year] Reef Buddies. All rights reserved. Website by Denkbar Digital Agency Sydney.